How do I create a document template with Mergefields in Microsoft Word? Rocket Matter Knowledge Base Document TemplatesHow to create a document template. 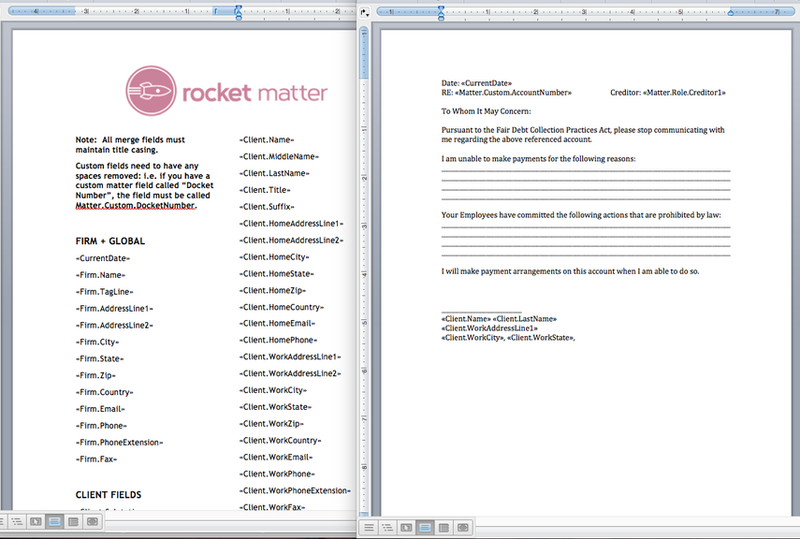 Document Templates are used to create custom documents in Rocket Matter. Templates are created as Word documents and populated with either standard Rocket Matter 'document merge fields', or with custom Rocket Matter 'document merge fields'. 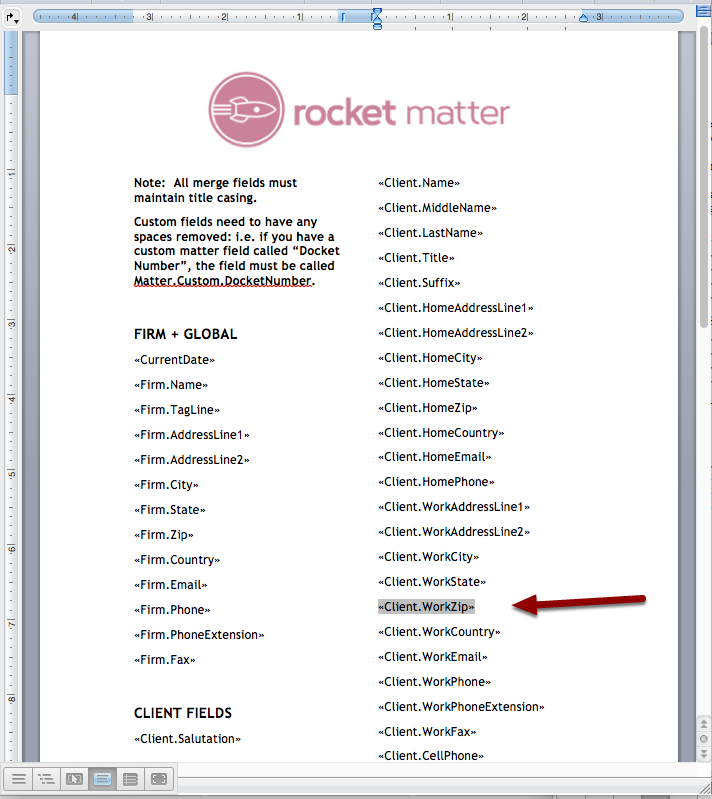 Rocket Matter document merge field lists can be downloaded from the Admin section. 1. 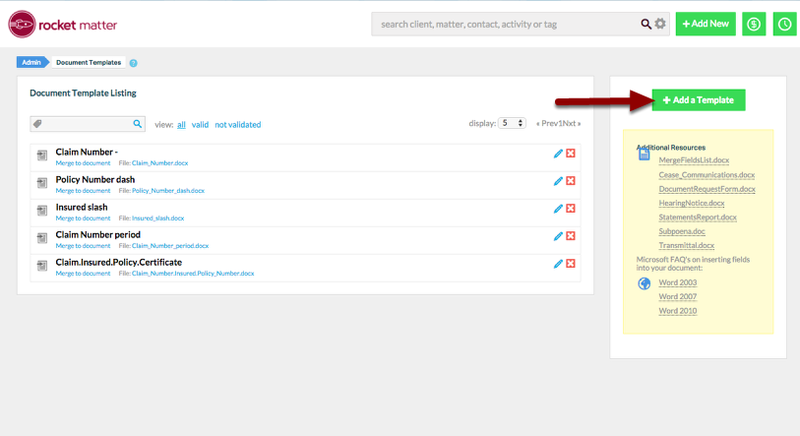 Navigate to your Tools section, and click 'Document Templates'. 2. 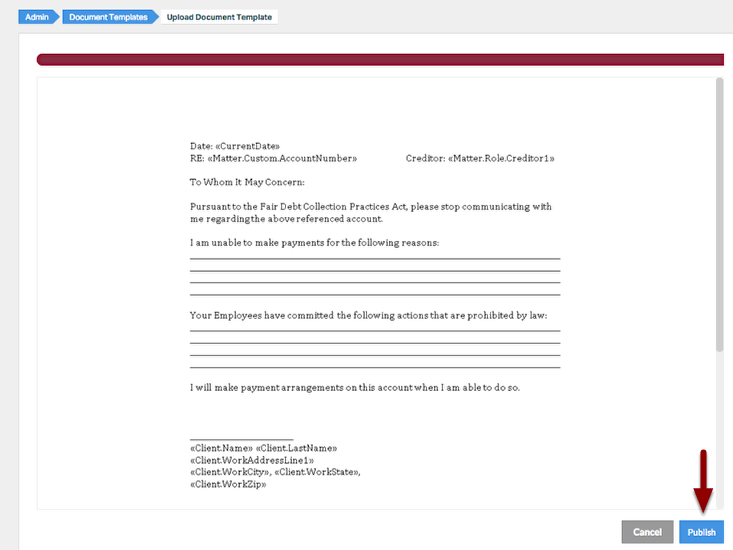 You can use the existing sample Templates in your account to work from, or you can create your own Template from scratch from a Word document. 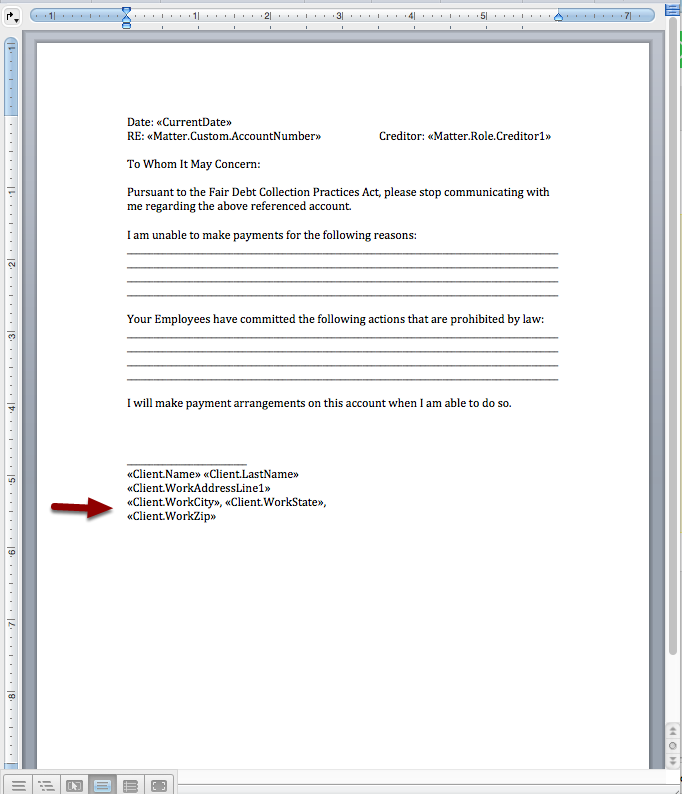 Please note that 'document merge fields' are different than 'invoice merge fields'. 'Document merge fields' and 'invoice merge fields' are *not* interchangeable. 4. 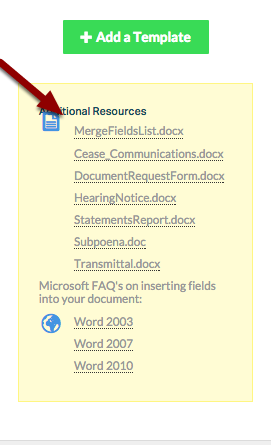 Open MergeFieldsList.docx in Word. Locate your desired merge field from the list of available fields. Zoom: 4. Open MergeFieldsList.docx in Word. Locate your desired mergefield from the list of available fields. 5. Copy the merge field. 6. Paste the merge field into your Word document. 7. Edit the merge field by highlighting it, and right-clicking on it. Apply formatting as needed. - Edit font, size, style, etc. by selecting options in the right-click menu, or in your Word toolbars. 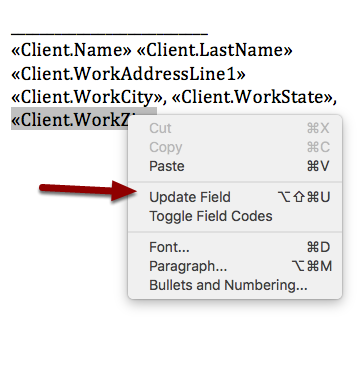 - Modify the contents of the merge field by selecting "Toggle Field Codes" in the right-click menu. After you make changes to the field content, re-toggle your merge field by right-clicking the field, and clicking "Update Field" again. - When working with merge fields, confirm that you've pasted a merge field, and not static text, by right-clicking and viewing the 'Toggle Field Codes' option. Only true merge fields will have the Toggle option appear in the right-click menu. 8. Update your edited merge field by clicking "Update Field". 9. 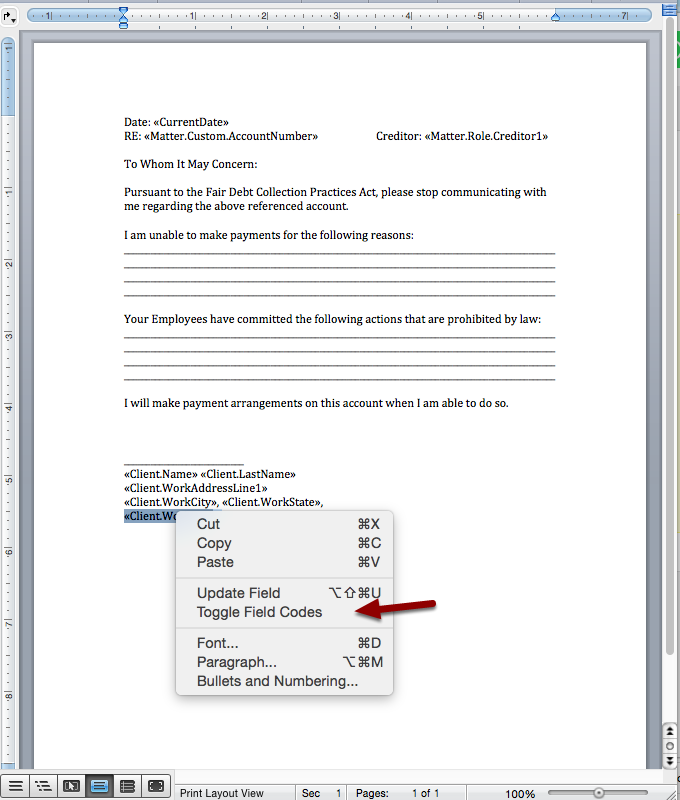 When you've finished modifying the document, save your document to an easy-to-reference location. 10. Switch back to Rocket Matter, and click + 'Add a Template'. * Follow the Rocket Matter prompts to select and upload the file. 11. Name the template, choose 'Author' and Tag it, if you use Tags. Click "Next" to save. 12. Preview your Custom Document Template, and click 'Publish'. 13. In addition to Standard 'document merge fields', you can add Custom 'document merge fields' to your Document Templates. There are two varieties of Custom fields: Custom Merge fields for Matters, and Custom Merge fields for Contacts. Prev: How to create a firm role and apply a custom rate by client. Next: How to insert a matter custom field into a document template.